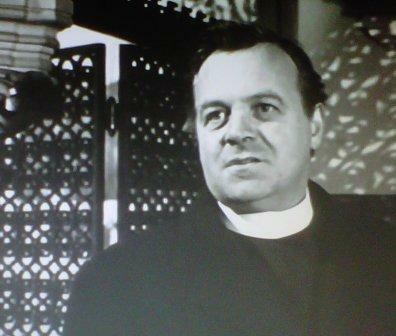 West 11 Patrick Wymark appears as Father Hogan in Michael Winner's 1963 film "West 11". Alfred Lynch stars as a young Notting Hill drifter offered a commission to murder a complete stranger. 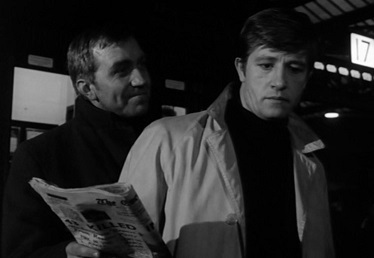 The plot may have overtones of a Patricia Highsmith thriller but the movie presents a stark picture of pre-swinging London. "We don't wear colour shirts to work, Mr Beckett", Joe is told when he arrives late at his sales job in a clothes store. And London is still drab and black and white. In his autobiography, "Winner Takes All", Michael Winner comments that, "the movie gave me an opportunity to employ many of the actors I'd enjoyed watching as a youth including Diana Dors, Freda Jackson, Finlay Currie, Patrick Wymark and Kathleen Harrison". 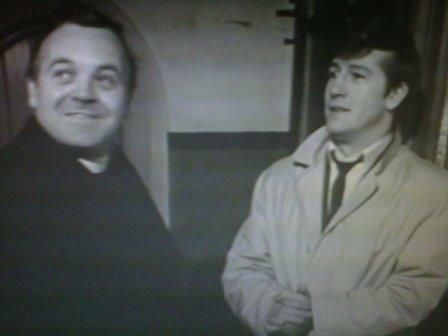 While Joe is still wrestling with his conscience he visits his family priest Father Hogan (Patrick Wymark). "I'm no longer a Catholic" he tells Hogan to explain his non-attendance at Church. "You can be a lapsed Catholic or an unworldly Catholic", Hogan tells him, "But you're still a Catholic." Wymark, who (like Beckett) once considered becoming a priest, depicts Hogan as a pugnacious minister who was "a Holy Terror" in his youth. Yet he is also drawn with some humour, being introduced taking a driving lesson and telling Beckett, "I suffer from the sin of pride on me three point turns." Adapted by Keith Waterhouse and Willis Hall from Laura Del-Rivo's novel, "The Furnished Room" the movie has the same sardonic humour as the duo's later TV series "Budgie". Eric Portman's shady Captain Dyce is introduced like a stage magician, striding into the Wimpy Bar where Joe Beckett (Alfred Lynch) is eating and snatching a cup of coffee from the counter, pocketing a box of matches from another table and making significant eye contact with a confederate who will later tail Joe. This happens behind Joe's back but deftly illustrates Dyce's declaration that he helps himself to life. "Men like me give orders - men like you follow". The movie's community of bohemians drifting from pub to party to jazz club is similar to that depicted by Plane Makers writer Peter Draper in his novel "A Season in Love", and Draper would write Winner's next movie "The System". What may strike modern viewers as odd is the attitude towards Silent, a significant role for Harold Lang , who more often appeared in scene-stealing cameo's. Silent is a shabby, disfigured hanger-on, tolerated at the edges of Beckett's community despite being identified by several characters identify as a police informer. Beckett's community aren't criminals although their lifestyle would doubtless bring some of them into conflict with the police. Silent draws a parallel between himself and Joe as outsiders, saying they've both "Got it up here" (tapping his forehead) although Silent envies Joe for his success with women and implies that he'll never have that success because of his disfigurement. In his introduction to "The Strength to Dream" Colin Wilson notes that he had read two manuscripts for first novels; "Both dealt with dissatisfied young men living in dingy rooms in London, drifting from cafe to cafe, getting involved in casual sexual relations, discussing religion and politics with a sense of futility rather than enthusiasm" . Wilson concludes that "Any author who sets out to write honestly of his time will find that there are a limited number of attitudes to draw upon"
Wilson's introduction came to mind when watching "West 11" - Laura Del Rivo, who wrote the source novel "The Furnished Room" was a friend of Wilson who took over his room in Chepstow Villas when his celebrity forced him to move. Interestingly, one commentary suggests that Del Rivo has been sidelined by history, partly because she is a woman and partly because she challenged, rather than revelled in the world of the 1950's Outsiders. The views expressed in the novel are softened by the more crowd-pleasing needs of the movie. Del Rivo's Beckett is fascinated by Nazi concentration camp atrocities, and feels the urge to attack black men in the street (by contrast, the movie Beckett shrugs in bemusement at a lone black man watching Brian Wilde giving an anti-immigration address). It seems easier to believe that the Beckett of the novel would accept a commission to murder a stranger because he's already halfway there. Similarly, when Beckett visit's Father Hogan in the novel, the challenging Father Dominic accepts that the Church has murdered millions, arguing that it was necessary to maintain order.